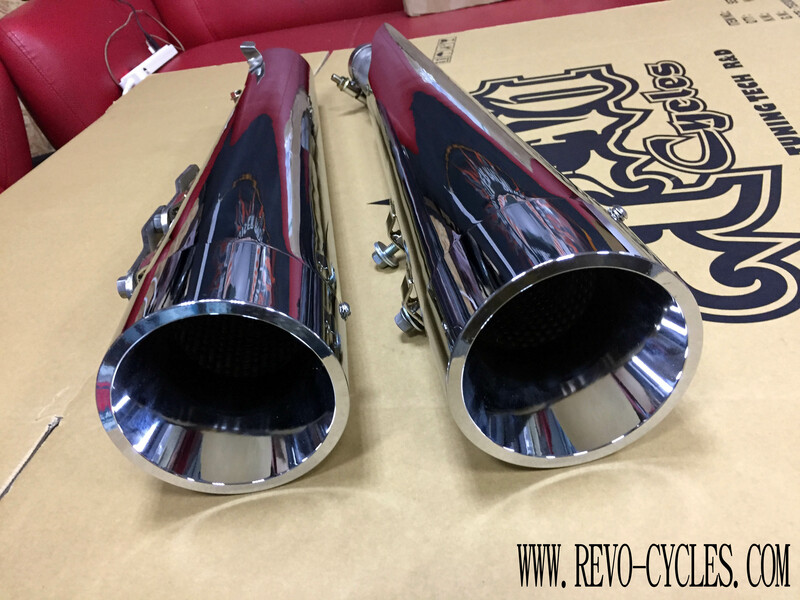 Home / “NEW” REVO MEGA 4″ Slip-On Mufflers! “NEW” REVO MEGA 4″ Slip-On Mufflers! Newly developed classic cone-shape muffler with outstanding performance and astonishing sound! REVO have been working on developing exhaust for M109R riders many years. We got 2-1 cannon 5″, 2-1 monster 6″ and good reputation in this field, in 2018 we represent our new product which is REVO MEGA 4″ slip-on muffler. • Sound astonishing and aggressive, make your M109R sound like a sport bike! • MEGA 4” slip-on used DuPont Teflon or four-step chrome-plating process. • Different from REVO monster 6”, MEGA4” specialize in horsepower increase and quick throttle response. • All necessary mounting hardware and instructions included ensuring problem-free installation. • Made in USA and processing in Taiwan.